It's a busy season...I don't know why it's always that way for me...more work over the Holidays than in the summer. But that's alright. Here's what's been going on. I received my advance author copies of "Dear Cinderella" from Scholastic. 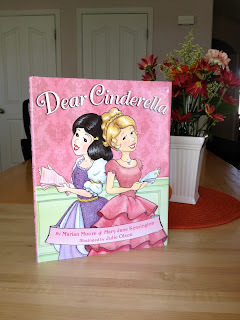 I illustrated this cute girly book and it'll be out in February 2012. It is always fun to see the finished result of months of hard work. And they even added glitter to the cover (glitter always makes things even more special, right?). I love it. My seven year old daughter read it again and again the day it arrived. Christmas came early for me. I'm sorry this book can't be to you by Christmas, but you can pre-order it so it arrives when it's released if you'd like. I've also been working on adding color to my ebook and I just finished and sent off all the sketches for another book I'm illustrating. It's nice to feel productive.